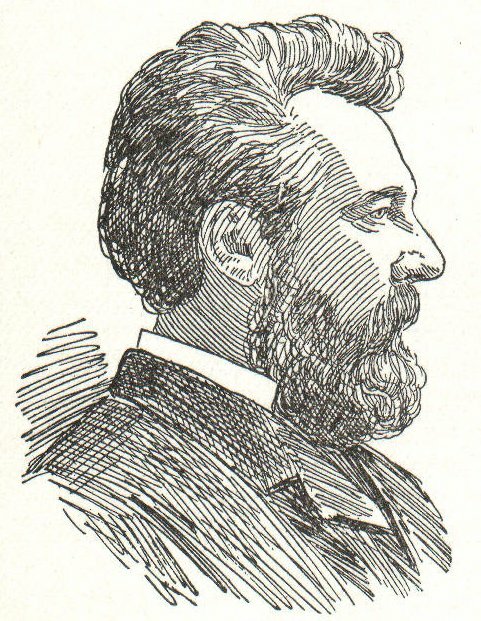 Alexander Graham Bell was born in Scotland. His mother, who was deaf, was a musician and a painter of portraits. His father, who taught deaf people how to speak, invented "Visible Speech". This was a code which showed how the tongue, lips, and throat were positioned to make speech sounds. Graham, or "Aleck", as his family called him, was interested in working with the deaf throughout his life. When he was a teenager, he and his brother Melly used the voice box of a dead sheep to make a speaking machine that cried, "Mama!" This created even more interest in human speech and how it worked. When he was in his early 20's, his two brothers died of tuberculosis. * Bell himself had the disease and his father moved the family to Canada looking for a better climate in which to live. Bell recovered from the disease. Two years later he went to Boston to open a school for teachers of the deaf and then became a professor at Boston University. It was at this time that he met Mabel Hubbard, one of his students who was 10 years younger than he. 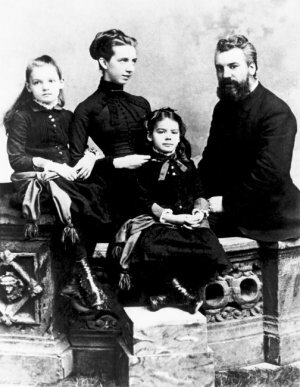 Mabel had become deaf at the age of four due to scarlet fever. Five years after their meeting they were married. At the wedding ceremony he gave her a gift of all but 10 shares of the stock in the newly formed company called Bell Telephone Company. They had two daughters and two sons. Their sons both died at a young age. Thomas Watson became an associate of Bell. He made parts and built models of Bell's inventions. One day while they were working Bell accidently heard the sound of a plucked reed* coming over the telegraph wire. Watson had been tuning the metal reeds in the next room. Bell drew up a plan for the telephone and they continued to experiment. The next day he transmitted the famous words, "Mr. Watson, come here. I want you!" 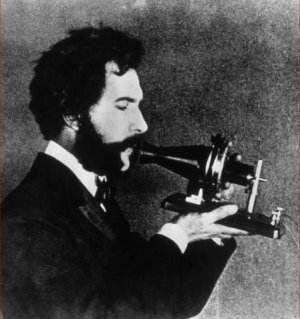 A few months later on Feb. 14, 1876, he applied for a patent on his telephone. He knew he would have to work quickly to get the patent* because other people were also trying to make an invention to transmit the human voice. Elisha Gray claims he too invented the telephone, but Bell got to the patent office an hour or so before he did. It is said that Antonio Meucci also succeeded with the invention before Bell. Because Bell had the patent, he had the right to be the only one to produce telephones in the U.S. for the next 19 years. He showed the invention to Queen Victoria of England and she wanted lines to connect her castles. By 1917, nearly all of the United State had telephone service. He continued to invent other things. He developed a method of making phonograph* records on a wax disc. He made an iron breathing lung, and a device for locating icebergs at sea. He experimented with sheep. He was interested in kites that could lift a man, and he invented a hydrofoil* which set a world speed record of over 70 miles per hour. He along with others started the National Geographic Society and he served as its president for several years. 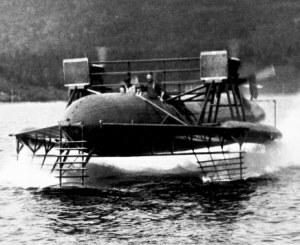 He and Enrico Forlanini built a hydrofoil and named it HD for "hydrodome". The first one glided across the water at 30 mph, then later they developed one that would go 50 mph and finally by the time they got to HD4 they were going 70.86 mph! It was the fastest hydrofoil in the world, and that record would stand for ten years. Bell liked making kites. 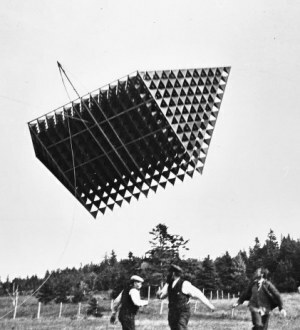 His favorite kite was the tetrahedral, a four-sided object whose sides and base are all triangles. The massive kite shown in the photograph above is made of silk and wood. He called it the Frost King. One day one of the workers was accidently lifted forty feet into the air. When he saw this Bell knew he was getting closer to realizing his dream. He became a U.S. citizen, but he died in Canada at the age of 75. This biography by Patsy Stevens, a retired teacher, was written in 2003. At biography.com search for Alexander Graham Bell. inventor of telephone before Bell? Pictures courtesy of Wikimedia Commons and the Alexander Graham Bell National Historic Site of Canada. i had to do a science report it kind of helped me but there wasnt anything sort of different like all of the other websites had all th same info. is any of this aloud 2 b used in a science physcics thing im doing? The pictures from the museum may not be used. I used them with permission from the museum. http://gardenofpraise.com/agbell.htm You would need to contact the museum about using them yourself. Some of the information was quite useful but other parts were actually incorrect. This page displayed 777,198 times.